I picked this one up from the library as research for my work-in-progress. 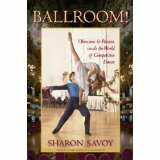 It’s written by a former competitive dance champion named Sharon Savoy. She starts with her own background and journey through the world of dance, but also gives lots of background and insider information. I learned lots of good stuff that may not make it into the book, but just knowing that process of dressing and styling is referred to as grooming is helpful. It’s the kind of little detail that adds verisimilitude to the story. My rough draft is done, but as I go back and begin the rewrite and polish, these details are just what I need. The book is well-written, although occasionally a bit stilted. The pictures are an album of 1990s hair and costume styles. It’s worth every penny I’ll have to pay when I return it, overdue, to the library tomorrow.